Antagonist Review 2019: Is Antagonist a Good Hosting? Antagonist is a shared and reseller hosting provider that serves over 100,000 websites and just as many customers. They are based in Netherlands and most communication happens in Dutch, but their customer service speaks perfect English as well. 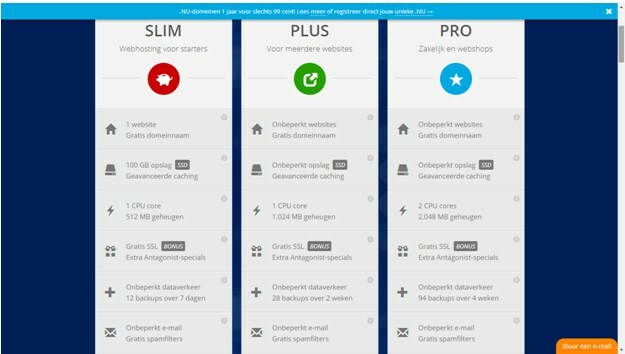 Founded in 2004, Antagonist primarily delivers web hosting services to customers in the Netherlands and Belgium. They’re headquartered in the Netherlands and most communication with them happens in Dutch, but upon request their customer service can also answer all your questions in English. Although they only serve two countries, Antagonist has a sizable customer base spanning over 100,000 customers. I thought the generous SSD storage, unlimited bandwidth, and free SSL certificate was a nice touch for an affordable entry-level package. Plus, they offer free website migration if you already have a domain hosted with a different provider — a service that would sometimes cost you an extra fee with hosting providers. Their one-click app installer allows you to easily set up over 75 of the most popular platforms, including WordPress, Drupal, Joomla!, MediaWiki, and OpenCart. One of the lesser-known perks about Antagonist is that their servers are located in the Netherlands, which means the country’s data protection and privacy laws apply. This will be particularly appealing to individuals living in countries where freedom of speech is an issue, or to businesses who are concerned about governmental authorities performing unwarranted seizures of their data. With 99.9% uptime and 24/7 monitoring of their platform, Antagonist’s server performance is on point. Considering that their hosting packages include so many bonus features, their prices are definitely appealing. Moving between plans is also super easy with Antagonist; it takes mere minutes to complete the process once you contact their support team. Upgrades are instant, while downgrades only become active after the current billing period. Unfortunately, this internal migration service isn’t free — in fact, it costs quite a bit! However, if you have loads of databases, existing email accounts, and customized settings, you might find this a convenient option. I can easily say that Antagonist has one of the most genuine customer support teams. When I contacted them, they took the time to specifically answer all of my questions — it was clear that they had not just stuck to pre-written scripted replies. They guarantee a response time of under four hours to any submitted tickets, and if you flag it as urgent, they’ll respond to it immediately. You can reach them via email, live chat, Facebook, Twitter, and their forum. Antagonist is an honest and transparent hosting provider that lists all of their strengths and weaknesses up front. Individuals and small businesses that choose their service can be assured of a positive working relationship. Wondering how Antagonist stacks up against other Web Hosting companies? Enter any other Web Hosting company and we will give you a side-by-side comparison.